Looking for a place for the entire family to spend an afternoon or even a full day? Consider spending the day outside at Snow King Mountain or Jackson Hole Mountain Resort. Both ski resorts have invested in turning their bases into exciting summer destinations that the entire family can enjoy. We’ll take a look at the top summer outdoor activities at each. You can easily spend the entire day exploring under the shadow of Rendezvous Mountain. 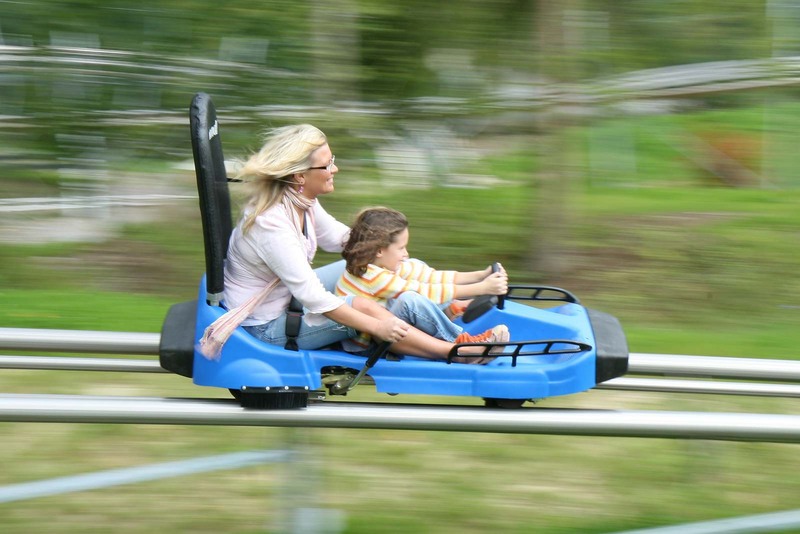 Kids of all ages and kids at heart will find thrills at all levels. 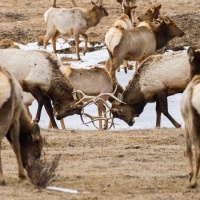 Try one of Jackson Hole's newest outdoor adventures. Work with a knowledgable guide to cross suspended bridges, scale along granite walls, and enjoy the experience of alpine climbing in a safe and educational way. Perfect for families, groups or individuals of all levels. 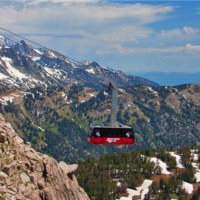 Take the iconic tram and soar to 10,450 feet above sea level for unrivaled views of the valley that makes up Jackson Hole. Or enjoy great views, food, and drinks from the Deck at the top of the Gondola. You may also let your feet dangle from the Teewinot chair as you watch those brave enough to tackle the bike park below. Sightseeing tickets include rides on all three. Watch the kids take on challenging obstacles on the ropes course or climbing wall. Younger kids will love testing how high they can fly on the bungee trampolines. Let gravity do all of the work while cruising down trails of all difficulties. Bike rentals, helmets, and pads (for those looking to go big!) are available at Jackson Hole Sports at the base of the bike park. Rather get your thrills from culinary delights? Take the Gondola to one of four restaurant options that can suit and any taste or budget, from the delicious menu at Piste to a slice and a soda at Off Piste. If you’ve worked up an appetite all day in the adventure or bike park, then head to The Deck for happy hour and small plates in the evening. Hiking, pop jets, and disc golf, are there for those who want to spend the day outside without spending any money at all. Find out what's happening at Jackson Hole Mountain Resort here. Brand new this summer Snow King offers a one stop destination for the entire day. Centrally located in the town of Jackson, you can walk to the base from many downtown hotels. The Big King Pass is the best way to experience everything the King has to offer! For Summer 2019, guests can buy a one-day pass that includes one tour on the Treetop Adventure, and unlimited rides on all open activities including the Cowboy Coaster, Mini-Golf, Alpine Slide, Amaze’n Maze, Bungee Trampoline and Scenic Chairlift! Speed demons and slow pokes alike will enjoy these two gravity powered rides as they allow the rider to choose their own speed. Leave the breaks off and fly down as fast as you can or take it easy and enjoy the leisurely ride down to the bottom. 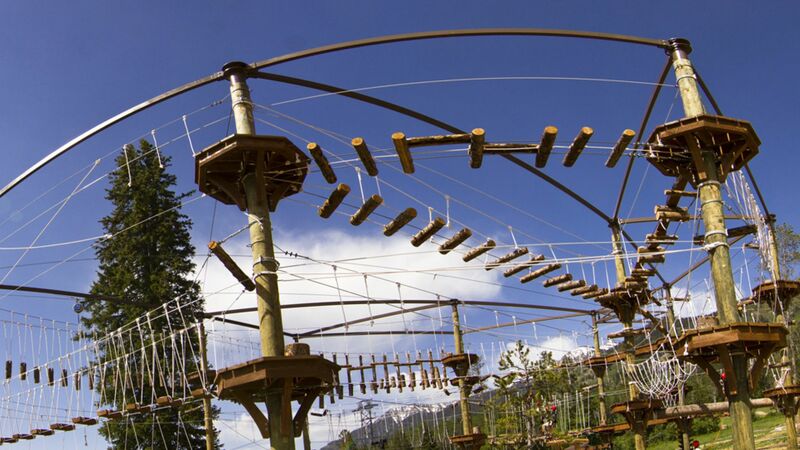 Jackson Hole's newest ropes course has obstacles that will challenge even the most accomplished tree climbers. Over 100 obstacles or almost 3 hours in the full course and younger kids can take on the "flying squirrel" beginner course. This one can be pretty exciting even for skiers who are used to riding uphill in the chair. The trip riding downhill is a brand new experience. Views from the top of Snow King are arguably the best in the valley with a panorama of the entire Teton Range. Feel like getting some exercise during your vacation? 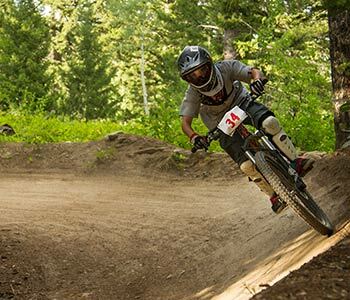 Miles and miles of trails crisscross the mountain and climb almost 1600 vertical feet to the top where riders can then descend they way they came or travel further into the Gros Ventre Mountains. Bike rental is available at Snow King Mountain Sports. Jackson Hole has a rich history of rock climbing and mountaineering. Channel your inner mountain goat and test your strength on this climbing wall that doesn't require the use of a rope. Best of all it's free! 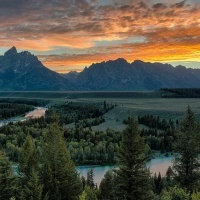 For help with planning your Jackson Hole summer getaway, give us a call at (888) 838-6606. We can help you plan your lodging, flights, and activities!